Toy Aisle: San Diego Comic-Con Reveals and More! 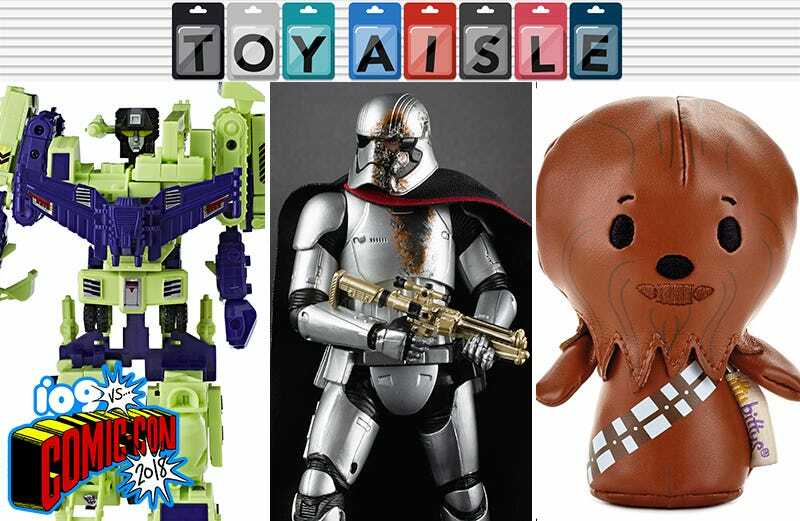 Welcome back to Toy Aisle, io9's weekly round up of all things toy. This week, we’re shipping ourselves off to San Diego and staying in a cramped convention hall with tons of new announcements.. an a few toys that slipped out earlier in the week. Plus, Mario Kart Hot Wheels, the Golden Girls(! ), and so much more! Will Captain Phasma return for the next Star Wars film after her fight with Finn? That’s like asking if the next Star Wars film will still have lightsabers in it. Disney would be foolish to walk away from a character who yields so many lovely action figures, including this new Hasbro Black Series Phasma with battle-damaged armor and helmet. Look closely through the figure’s shattered visor and you can see Gwendoline Christie’s eye staring right back, reminding you her fight’s not over yet. Why it’s taken Mattel so long to connect with Nintendo for a line of Hot Wheels Mario Kart vehicles is beyond us, but at Comic-Con it was revealed that some of the franchise’s most popular characters are finally being miniaturized so they’re compatible with those iconic orange race tracks. They’ll set you back $5 each, but you’re going to have to keep on waiting until June of next year to find these, and accompanying Mario Kart playsets, in your local toy aisles. Just whisper the words, “Batman: The Animated Series,” and we’ll whip out our wallets faster than Bruce Wayne can put on his bat-cowl. As cartoons go, it’s one of those rare childhood favorites that still holds up well into adulthood, which Mondo is counting on, because we don’t know too many 10-year-olds who can afford a $145, 12-inch Mr. Freeze figure. That’s not cheap, but at the same time, Mondo has included some lavish detailing with this one: The figure boasts 28 points of articulation, an animation cel-inspired paintjob, and a bunch of accessories including swappable heads, a freeze ray, and a tiny ballerina snow globe. You can pre-order one now, but you’ll have to wait well into 2019 for Victor Fries to ship. Every decade or so, Hasbro digs out the original moulds and starts producing classic G1 Transformers toys again, much to the delight of grownup ‘80s kids. This year it’s working with Walmart for a small re-issue run featuring Starscream (who now includes a miniature Megatron blaster), Hot Rod, a box-set of smaller Legion Class Transformers including Bumblebee and Outback, and the neon green glory that is the original Devastator Constructicons set. They should hit stores later this year, but the Constructicons are already appearing on the Walmart website, with a $74 price tag, but no option to pre-order just yet. Between Funko, Lego, Hallmark, and a bunch of other toy makers, there’s no shortage of collectible adorably deformed figures to adorn your shelves with. Hallmark’s itty bitty line has the added bonus of being plush, so they’re kid-friendly, which is the perfect excuse when you walk up to the cash register with an armful of them. At San Diego Comic-Con, Hallmark unveiled a handful of new exclusives, including a faux-leather itty bitty Chewbacca that looks like the Wookiee is finally letting his freak flag fly. Even in a galaxy far, far, away, who are we to judge how Chewie spends his free time? If NECA’s new Chia Pet line doesn’t adequately satisfy your craving for Golden Girls merchandise, the company’s new eight-inch figure line featuring Dorothy, Sophia, Blanche, and Rose will. Available in early 2019 as a $115 box set, the fully articulated figures feature retirement-ready outfits, but, from what we can tell, no kung-fu grip, which is a missed opportunity. What happens when you find yourself stuck on a planet where the temperature is dropping and you can’t beam back onto your starship? You do what Sulu in the original Star Trek episode “The Enemy Within”— you use your phaser to super-heat a rock so you can huddle around it and keep warm. But since phasers don’t exist in real life yet, ThinkGeek’s faux-rock mood light is a more achievable alternative. 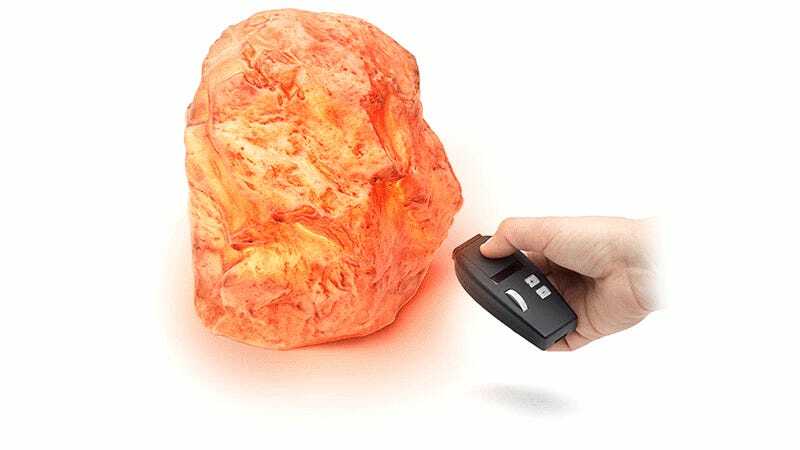 For $70 it includes a tiny phaser remote that can activate five different glowing light show patterns, and seven different colors, when you’re done pretending to zap a rock. How many board games do you own that pack away into an anthropomorphized pickle container suitable for display? None, because Cryptozoic Entertainment’s new $45 Pickle Rick Game doesn’t hit stores until September. But if you find yourself at Comic-Con this week, you can check out the gameplay which recreates part of Rick and Morty’s most popular episode. One player takes the role of Pickle Rick, trying to escape an armed compound, while the other players pretend to be Russians and Jaguar trying to stop the brined hero from succeeding. Can you really have a popular TV show about wrestling and not release action figures to go along with it? It took two full seasons, but Netflix’s GLOW is finally getting the action figure treatment. Funko is not exactly known for its attention to detail or focus on lifelike accuracy when it comes to its action figure lines, but the limited articulation of these Debbie “Liberty Belle” Egan and Ruth “Zoya the Destroya” Wilder figures bring back fond memories of the crude WWF figures I had growing up. These will be dropping into the squared circle sometime this Summer. Have you ever tried going into a dart blaster battle holding your smartphone against your ear? Of course not, you’d be a sitting duck. If you want a better way to stay in touch with your teammates for coordinating attacks, Buzz Bee Toys’ new Covert Squad blasters feature built-in walkie talkies that work with mic-enabled headphones. You can chat or trash talk up to 300 feet away from other players, which is far enough to be safe from each blaster’s 100-foot range. A pair will set you back $25 at Target come August. Robotic horses have been a long occurring theme in science fiction, because presumably one day everything will be a robot. BraveStarr had one, He-Man had one, and now your kid can saddle up on this $400 cyber-horse from Kid Trax, and never have to worry about shovelling manure. You can think of Scout as a cross between those giant stuffed animals you can sit on, and a Power Wheels ride-on vehicle. 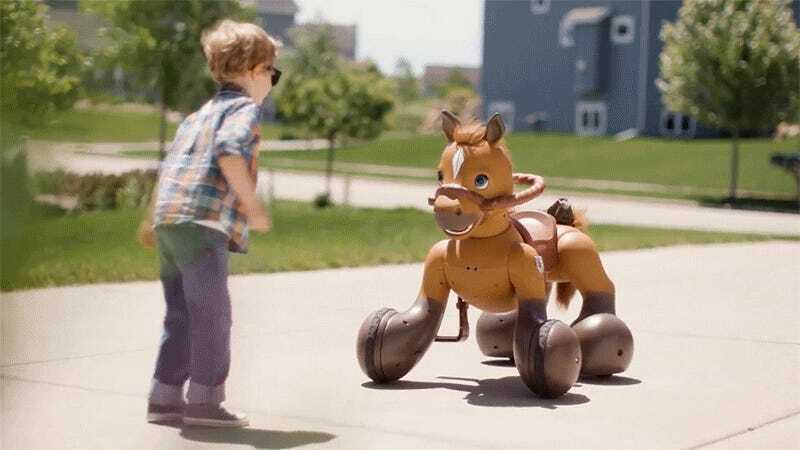 Powered by a 12-volt rechargeable battery, Scout has 100+ different sounds and movements, and can “trot” at speeds of up to four miles per hour without the risk of a get every getting thrown off the saddle. Can we get these for adults too?